What about open adoption agreements? What do adopting parents need to consider when entering into an open adoption? When do adoptees get to have a say in their open adoptions? How has social media changed openness in adoption? For November — National Adoption Awareness Month — Rachel Garlinghouse (author of the new children’s book Black Girls Can) recently interviewed Mile High Mamas columnist Lori Holden on Adoption.net. She asked great questions, and here we share Part 2 of their interview (find Part 1 at LavenderLuz.com). Rachel Garlinghouse:What is your view on open adoption agreements (whether legal agreements or agreements made under the supervision of an agency)? Lori Holden: A PACA (post adoption contact agreement) is one way to deal with the power imbalance that’s inherent in adoption. An agreement can help give birth parents recourse should the relationship begin to close down. However, implementing a PACA could be problematic. One, it could be expensive to take legal steps to resolve conflict; and Two, doing so could make an already shaky relationship even more adversarial. In the plus column, a PACA can clarify expectations so that parties decide what is important to them and make written promises to each other about these key points. In that way, it’s kind of like a divorce decree — it gets everyone on the same page and provides a document to refer to if someone goes off-page. That said, in an ideal relationship the spirit of an agreement is more important than the letter of an agreement. I think of our open adoption relationships as more of a marriage than a divorce. 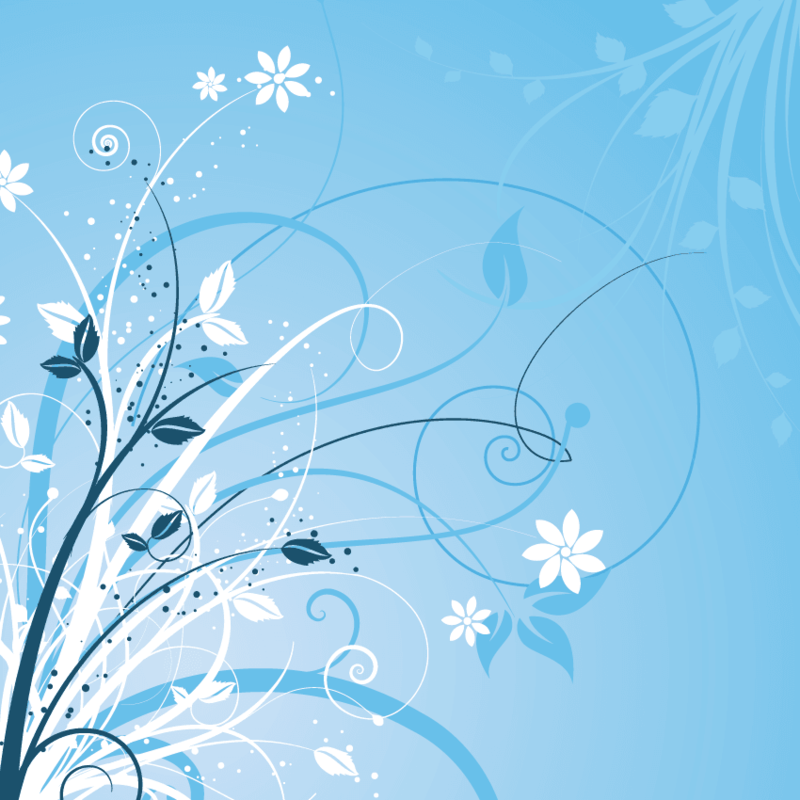 Our ideas and values bond us and have held us together during trying times over the years. If an adoptive parent is considering open adoption, what should he or she keep in mind? Make sure you’re also open to doing work on yourself. You will likely be faced with many of your own insecurities and fears that arise as you acknowledge that other people are vitally important to your child in a way you are not — just as you are vital in a way they are not. Be willing to deal with your insecurities mindfully, and put as much effort into changing yourself as you do into trying to change others in your adoption relationships. At what point should the adoptee have a say in continuing with openness or changing it, either with more or less contact? For us managing first parent relationships has been a gradual transition. My children have been taking over the reigns since they were, oh, 9 or 10. My role and my husband’s have morphed from managers to coaches to supporters sitting on the bleachers (but we’re ready to be called onto the field if necessary). How has social media changed open adoption? Social media has made a huge difference in opening up adoptions. It has had a significant effect on secrecy — it’s now easier than ever to sleuth for a placed child/adult or a birth parent based on scant clues. And as I mentioned in Part 1, the Internet has enabled voices for reform to connect and join together. I can only imagine what it must have been like to be a lone birth parent thinking you were the only one who wasn’t able to move on, to act as if nothing had happened. Or to be an adopted person who was certain she was an anomaly for loving her adoptive parents yet wondering about her birth parents. The Internet allowed people to find other people just like them! The Internet is inherently about openness and interconnectedness. And adoption can be, too. 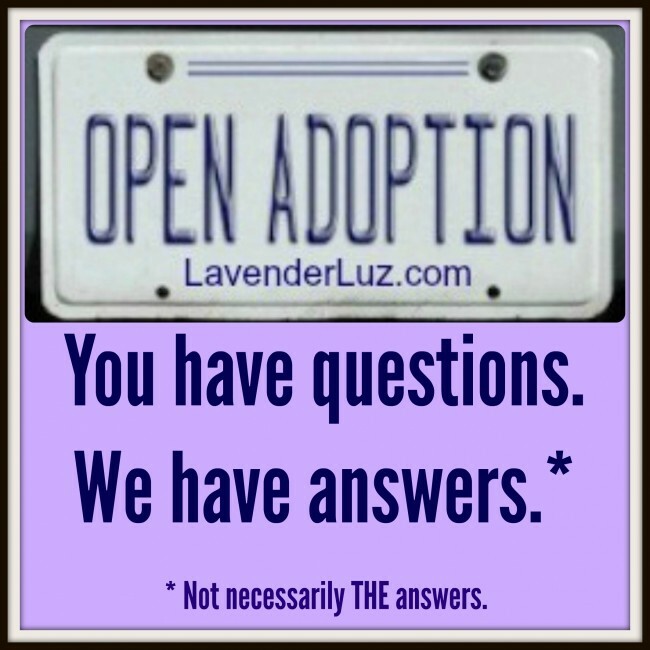 Click over to Part 1 of this interview on LavenderLuz.com, where Rachel and Lori address why agencies are suggesting open adoptions, the benefits and difficulties of open adoption, and the possible long-term effects of living in one. 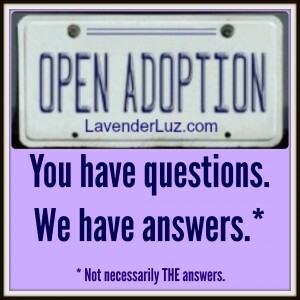 Lori Holden blogs at LavenderLuz.com and is the author of The Open-Hearted Way to Open Adoption. What a tremendous resource you are. I admit I have no idea how involved the whole process is, particularly as it pertains to power imbalance.